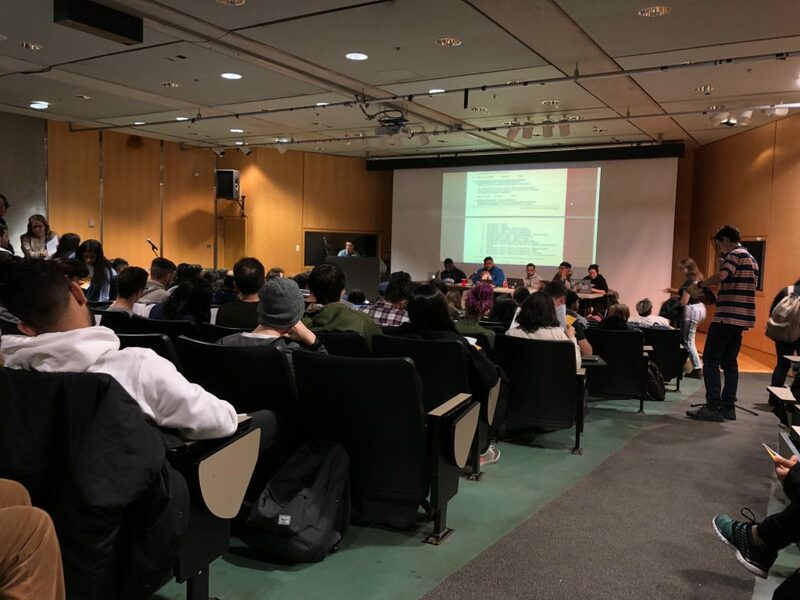 Students against Ontario Premier Doug Ford’s free speech mandate have a new group in their corner following the Ryerson Students’ Union (RSU) semi-annual general meeting on Wednesday night. Members passed a motion requesting that the RSU formally oppose the Ford government’s mandate, and support students who refuse to participate in its implementation. The motion was moved by Ryerson student and Socialist Fightback Club member Olivia Pape, who said she worried that Ryerson’s freedom of expression policy could affect her group — and other student groups’ — right to protest on campus. On Aug. 30, Ford said Ontario universities and colleges will face funding cuts if they don’t submit a free speech policy by Jan. 1, 2019. In response to the mandate, Ryerson proposed an update to its statement on freedom of expression, saying that while it will sometimes be divided over ethical and social obligations, it’s not the university’s role to censor speech. The proposed statement has ruffled feathers, particularly among on-campus student equity groups. But members at the RSU meeting say they’re hopeful the motion will provide additional support for students fighting back. “I think it’s good that the RSU is supporting equity staff and student groups protesting against hate speech on campus because there’s some scary stuff going on,” said Kimberley Vaz, a fourth-year Ryerson social work student. Vaz said she worries the freedom of expression policy will hinder her ability to protect pro-choice students on campus. If the statement is approved, students who obstruct or interfere with the freedom of others to express their views could face punishment from their institution. Looking to protect students, Pape’s motion included a resolution for the RSU to demand that Ryerson administration refuse to implement any policy that would restrict the right for students to protest on campus. David Jardine, a fourth-year computer science student, said he’s happy with the motion, suggesting that the RSU’s formal and public opposition to Ford’s free speech mandate could be the difference-maker for a lot of students. “I think when a vice-president of the students’ union is vocal about an issue, that makes a huge difference on campus and can make a huge difference for people who are negatively affected by legislation,” said Jardine. The resolution to reject Ford’s free speech mandate gained significant traction at the general meeting, but it wasn’t the only issue supported by the RSU. A motion was passed to increase the 2018-2019 career development grant, which financially supports students struggling through an unpaid internship, from $15,000 to $35,000. Additionally, members passed a motion for the RSU to advocate for a “dedicated study day” in-between the last day of classes and final exams, for undergraduate students. Not passed were a number of motions challenging the RU-Pass referendum. RSU president Ram Ganesh said his group doesn’t have the jurisdiction to revisit the election, which was run by the Board of Governors. Reflecting on the meeting, Pape said she hopes to see the same initiative by the RSU to move forward with her motion. So the students are actually against free speech not for it. What a disgrace. Your title is terribly wrong “RSU AGREES TO REJECT FORD’S ATTACK ON FREE SPEECH”. In your article you write “If the statement is approved, students who obstruct or interfere with the freedom of others to express their views could face punishment from their institution.” This means the STUDENTS are actually against Free Speech, not Ford. The fact you even put this sentence in your piece is crazy to me, because it literally contradicts your title and the message your trying to push. This is grade school journalism. Also the bias in this article is crazy. You will never make it as a journalist with this type of propaganda. Well maybe as a “journalist” on Fox news. Please do better Jennifer La Grassa and Anna Wassermann!